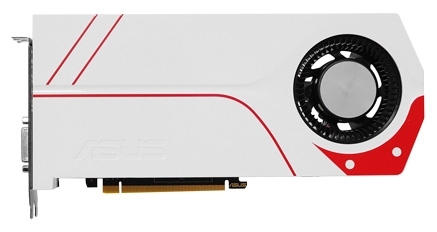 ASUS has continued to build its own range of GeForce 10 on NVIDIA Pascal GPUs, and on stage – release model Turbo GeForce GTX 1060 3GB (aka Turbo-GTX1060-3G-White) in a kind of retro style. Map remarkable infrequently used ASUS white-red coloring and the use of the cooler based on the centrifugal fan. 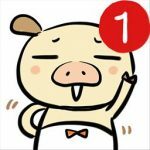 Lack of factory overclocking the graphics core is also now the exception rather than the rule, at least for the non-reference graphics cards. The novelty is based on the chip GP106-300-A1, the arsenal which includes 1152 stream Pascal processor 72 texture units (TMU), rendering units 48 (ROP) and 192-bit memory bus. The latter communicates with the memory chips GDDR5 total volume of 3 GB, running for 2002 (8008) MHz. The nominal frequency range GPU is 1506-1708 MHz. Cooler graphics card seems to “borrow” the model Turbo GeForce GTX 970 or Turbo GeForce GTX 960. As used fan is based on the double roller bearing, which, in the opinion of the ASUS marketers, will last four times longer than a certain reference bearing. The cooling system is far extends beyond the board, so that the air intake is carried out from two sides. In structurally similar to Turbo-GTX1060-3G-White card class GeForce GTX 970 under a decorative cover of the cooler is a simple aluminum heatsink; small consequent cooler is provided for system power transistors. On the last known only that in its composition applied electrical components Super Alloy Power II. The production process model Turbo GeForce GTX 3GB switch in 1060, like many other adapters ASUS recent years, fully automated in accordance with the concept of Auto-Extreme. Dimensions of the device are 264 mm in length, 121 mm in width and 37 mm (two slots) in height. For stable operation video connection needed the 6-pin cable PCI-E Power. The rear panel includes new items outputs Dual-Link DVI-D, HDMI 2.0b (2 pcs.) And DisplayPort 1.4 (2 pcs.). By means of two cables DisplayPort the screen can display an image with a resolution of 7680 × 4320 pixels. 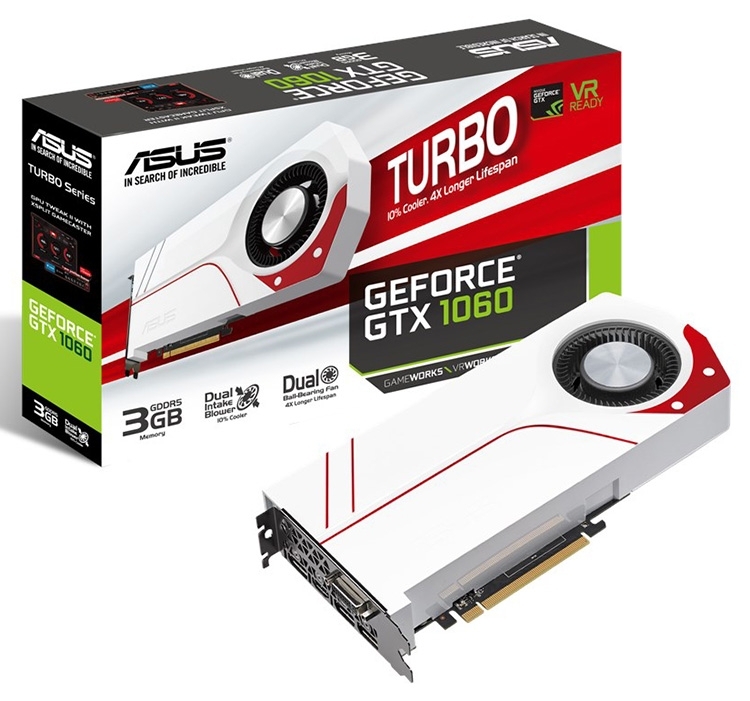 In Western European online stores model ASUS Turbo-GTX1060-3G-White is sold at a price of €192.